Whenever user copy, move, transfer, delete, unzip files, folders, shortcuts and anything else in Windows operating system since Windows Vista, there will be a prominent pop up dialog window that indicates that progress of the files and folders operation. 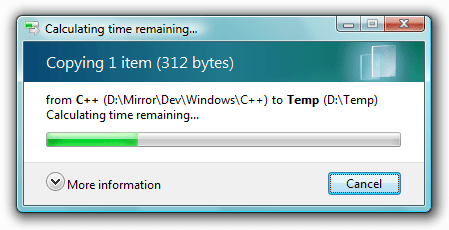 The window title with progress bar will start with something like “Calculating time remaining”, and then change to “About x hour and x minutes (or x seconds) remaining” while the copying, moving, deleting (permanently or moving to recycle bin) or extraction process is in progress, once the estimated time to complete the operation is determined. However, the calculation takes tens of seconds to go away. Thus it appears that the time to calculate this duration is taking up considerable time and slow down the file operation. However, this may not be the case. In fact, when the “Calculating time remaining” title is shown, Windows is supposedly still calculating estimated time to complete the file operation selected, but the actual file copying, moving, deletion or unpacking process has already begun. It’s not sure why the progress bar takes age to proceed forward, or why calculating time remaining message takes so long to show the estimating time remaining to complete the process visually. Sometimes, worse still, the “calculating time remaining” dialog may simply hangs and stays forever even after the operation is completed. There is no way to disable or turn off “Calculating time remaining”. In fact, it’s unlikely that is the calculating algorithm that causes the file copy/move/delete/decompress operation to be slow, and the estimated time remaining to complete the process is a good indication how long you going to wait especially if the operation involves big files or files in large size. If you’re dealing with slow file and folder copy, move, transfer, delete or uncompress (unzip) in Windows Vista problem, try out various workarounds and tricks to make the file operation faster.